Women of Color in a Disney live-action film. I’m already applauding and we haven’t started the interview yet. 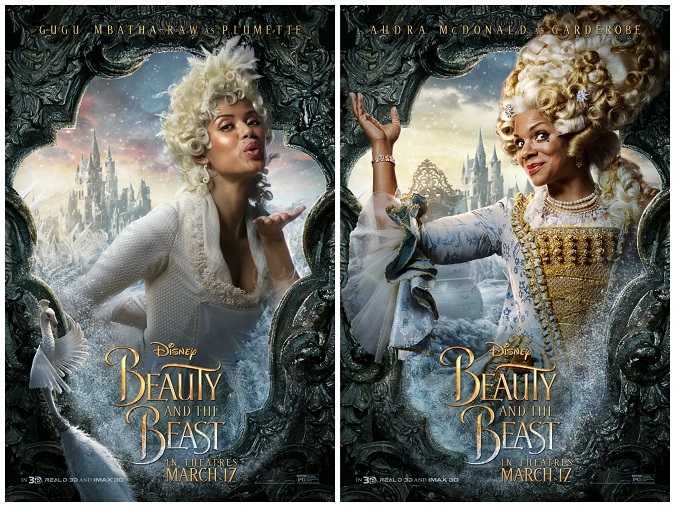 It was definitely noticeable that Beauty and the Beast got a modern makeover after 25 years – one that definitely perked my interest as a multicultural mom. 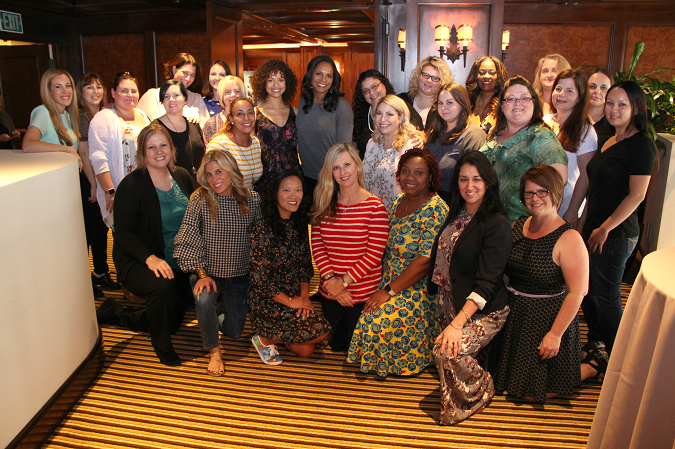 We got to sit down with Gugu Mbatha-Raw (Plumette) and Audra McDonald (Garderobe) for this unique Beauty and the Beast interview to discuss the extended roles of their characters, thoughts on the added diversity to the film (including the first ever interracial kisses in Disney movie history! ), behind-the-scenes fun and more. How can Disney make a classic even better? This is it. And while completely subtle, it’s something that I know that my family will notice. Modernizing a fairy-tale with the inclusion of more ethnicity in a film, it’s a serious dream come true. Who knew that in the process, Disney would be making movie history. Beauty and the Beast includes the first and second ever interracial kisses in a Disney live-action film. 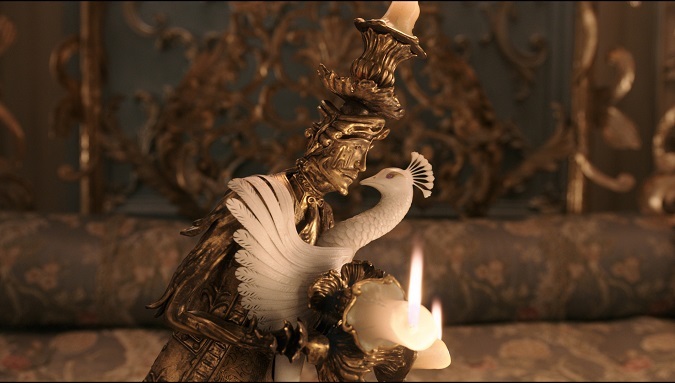 First occurring between Cadenza (played by Stanley Tucci) and Audra McDonald (Garderobe) and the second between Lumiere (Ewan McGregor) and Gugu Mbatha-Raw (Plumette). Gugu: We’re all just bringing ourselves and thrilled that Bill Condon, the director, had the vision to make it such a diverse cast. It wasn’t really something we discussed, which is kind of cool in this day and age, it just sort of is. Audra: We were doing press yesterday and someone was like, ‘So you guys are the first and second interracial kisses in a Disney film…’ And, Gugu and I are like, ‘we are?’ [LAUGHS] ‘Oh, okay. Cool.’ We didn’t even think about. Hopefully we’ll get to a day where no one has to think about it. I’m pleased that Disney recognizes that you’ve got to represent the entire world out there. And that’s what they’re doing. In love with the costuming for Beauty and the Beast? Me too! For Gugu and Audra, the elaborate period costumes were quite the transformation for these beautiful actresses. Gugu: Jacqueline Durran, incredible costume designer. On my first costume fitting, she said, ‘okay, would you like to meet your object?’ In the room, they had the feather duster on a stand. I was kind of taken aback because Plumette is quite different to the feather duster Fifi, who’s more mopped-like in the original. And I was pleasantly surprised to see that they made her into this sort of flying dove like/peacock like, very dainty creation. In the costume fitting, we played around with the bird theme. I had a big tail feather on one of my costumes, a huge bustle which also worked with the period. And feathers. I had feathers in my hair. We played around with this sort of Marilyn Monroe style wig so it was fun for me to be blonde, which is just so outrageous and audacious. It was really channeling a mixture of that playful flirty Marilyn thing with you know, feathers. Audra: We both got to be blonde. With the wardrobe, the dress being so large I couldn’t walk in any regular door to get to set, I had to walk sideways. And scrunch because once they started putting the wig on – they put the first part and I was like, ‘wow, that’s big, that’s tall’ and she said, ‘hold on.’ Okay,’ [MOTIONS ADDING ON MORE TO HER HEAD] she’s like, ‘okay,’ [MOTIONS ADDING MORE TO HER HEAD] and, ‘the top part,’ then birds and stuff started going. I was like ‘oh my goodness what is going on?’ But, it makes perfect sense because once she’s transformed it to the wardrobe, the top of the wardrobe if you notice is her wig. And you couldn’t even see them, but the shoes that I wore were the feet of the wardrobe. They curled up into the exact sort of way that the legs of the wardrobe. This is the detail that Disney pays attention to. 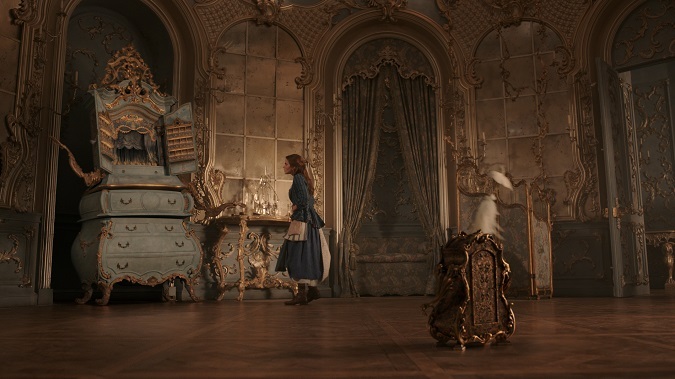 One of the biggest challenges for a live-action Beauty and the Beast was the creation of the objects for the film. How the heck do you bring those to life? It takes a village. Gugu: For me it was just so liberating. I mean, I’ve never been offered a role like this before. I had come from doing some quite intense dramatic roles. The idea of playing a feather duster, I sort of thought was so whimsical and fun. But it’s a lot of vocal work in the recording studio and finding not just the singing but finding the voice of the character, working on the French accent with the dialect coach and also just really going back to that childhood thing of ‘let’s pretend.’ You’re not limited by your face and your body. Audra: You have so much more freedom. It’s just play, really, when you get to you know this huge team who are creating these CGI characters. Bill Condon, such an incredible leader, and an amazing director. And you feel very safe with him. So when you’re doing the vocal work for the characters, it’s just you, the recording engineers and Bill. So Bill’s in there with you and he’s saying, ‘okay, now try one like this.’ He’s in there playing with you in a way. And it’s truly just make-believe. For the wardrobe it was like, ‘okay, she’s kind of trying to get to the staircase at this point so, grunt a little bit.Grunt like this, okay now snore this way, snore this way, snore and sing a high note.’ I mean so we had the time and the freedom to just explore. Then they take that, they go and work with the CGI folks. It’s a real collaborative effort. It takes a massive village for this one. What Would You Do to Be in a Disney Movie? Ever wonder how far you would go to be in a Disney movie? Audra McDonald reveals exactly what she would do. Loved this behind-the-scenes fun fact! Audra: The wig was literally two feet off of my head and so heavy and the dress was so big. Not only could I not sit down, but I could not hold my head up for long periods of time. So the set carpenters built me a lean-to. It was humongous, about three feet tall slab of wood that had a bicycle seat. So I could just perch on that and lean back between takes. I think we are all waiting with baited breath for the reception of this movie. Will the audience appreciate, respect, fall in love with this version of Beauty and the Beast? What messages can we take away from this fairy-tale today, over 25 years later? Gugu: I love the message that beauty is found within. It’s an oldie but a goodie. But, I think really for this film, the idea to look a little deeper. See the human within each and every person, even if the exterior is something that intimidates you or you’re not familiar with. There’s always a human underneath it all. And I think to try to connect to somebody’s soul, is really important. Audra: There’s always the love conquers all, love wins, and it’s not about just giving the love but loving yourself too. I think that’s so important. And realizing that what you have inside of you is most important and not the outside. Embracing diversity in a beautiful fairy-tale story, I love it on so many levels. See so much more of the characters Plumette and Garderobe in Disney’s all-new Beauty and the Beast, in theaters starting March 17, 2016. I love Audra McDonald – so glad to see her amazing voice will be apart of this treasure! Ewan McGregor is in Beauty and the Beast? I didn’t realize that. Too bad he was not part of the interviews.